The Angry guy from the last post is the Hamburger Kid, a character from the children's cartoon Anpanman. 1. Baikinman (yes bacteria-baikin) starts some trouble. 2. Anpanman comes to the rescue, but his head gets wet, or dented, or dirty (which causes him to lose all of his power) from something that baikinman does. 4. Anpanman gets his new head and then polishes Baikinman off with his AnPunch! (after being hit, Baikinman always exclaims "BaiBai-kin"(yes a play on words of bye bye and baikin, oh how clever). 5. The world is now back in order again until the next 15min. episode. Since I know the majority of readers to this site are either single, aren't parents yet, or not high, here is a glorified edited version I found on Youtube that you should find at least palatable. So with all this merchandising, what's left? Why of course, to complete the formula one needs to have a theme park. 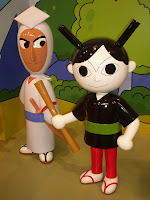 And the Yokohama Anpanman Museum just opened this year and that's where I took the family last week. Make your own DVD of you in an Anpanman episode (3,500 yen): yes we did it, it involved greenscreens and was cool, though now I have to watch it with the daughter almost every night. Great memorabilia though! I'd of course post it on Youtube so you all could laugh at me, but alas, it's copyright protected and I wouldn't want to break that right? JamOjisan's bakery: Since a lot of the characters are made out of bread, how fitting they have a bakery outside of the museum. All of the pastries are shaped like the characters, are only 100 yen a pop, and actually taste good too. One other reason to tolerate the show is with all the characters, you can always find one that reminds you of someone you know. Takers on who the guy on the left could be? Haha - is that a fanny pack around his waist I see? Wow. I think baking new body parts is a brilliant idea. When will modern medicine catch up? Yay! I can comment now! Um... AnpanMan is weirder than I thought.